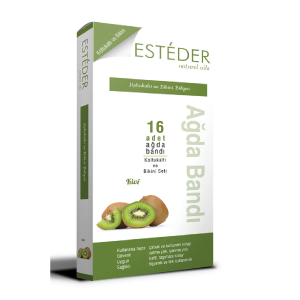 Your skin is cleaned profoundly and purified from dead layers and you achieve smoothness lasting until four weeks with ESTEDER Bikini Line and Armpit liposoluble wax bands. Special formula contains Shea Butter which is known with moisturizing feature and it carries the fragrant of KIWI fruits.Moreover the usage is very easy, yuo epilate the hair off their roots by a single move by means of special grasp strip. it is effective even for the short hair. Your hair becomes more sparse, thinner and softer by regular usage. Briskly rub strips between palms to warm wax for a few minutes. Slowly separate Wax Strip into two strips.Holding skin tight with one hand, quickly pull strip off in the opposite direction of hair growth.For the perfect finish remove any residue and apply Soothing and Finishing Wet Wipes.